This past week I did a quick social media survey about the best things that happened in Colton during 2018. One of the most noted was the re-opening of the Colton Café. 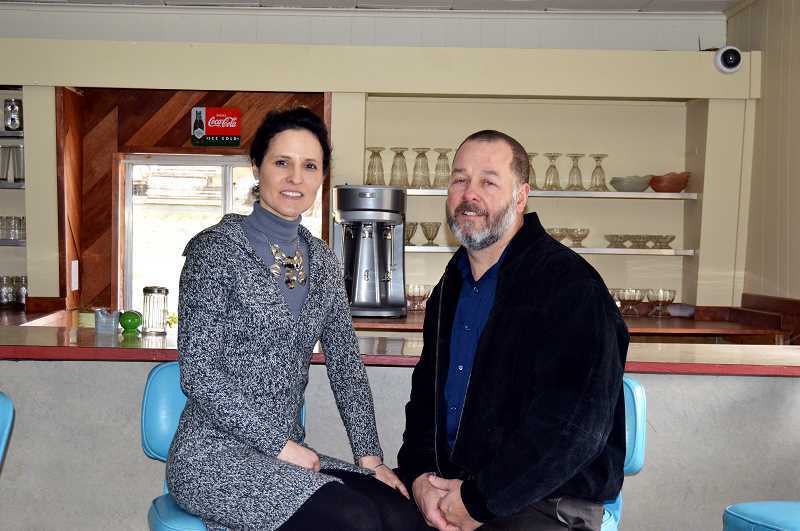 The local restaurant was purchased by Amy and Matt Hall on Feb. 27 and after remodeling, all the county permits were obtained and health inspections passed, they opened their doors to the public on July 18. Amy Hall says the response to the café has been wonderful. She talks about how impressed she is by her customers and the compassion and generosity the Colton community has. She loves the stories her patrons tell her and says they really touch her heart. "This last week, Tim Behrens (volunteer firefighter and president of the Volunteer Association) was in to pick up a gift card for the Volunteer Fire Department's Awards Banquet," Amy said. "One of our customers heard him and said they would buy one for the event, too." She tells of other instances of paying it forward and paying for dinners, like when a couple went to the café to celebrate their anniversary, and their dinner tab was picked up by others in the restaurant. "Colton community knows their support is why we are here," Amy said. "We are truly blessed to be here for our community. My family, staff and I appreciate our valued customers. We are looking forward to a fun and busy 2019, and excited to watch us grow." Also receiving votes was the Colton Middle School TAG team members, Cierra Ridenour, Anna Woodward, Laramie OeDell and Jacob Bell, who competed in Destination Imagination's state challenge where they earned enough points and were awarded a berth to the Global competition in Knoxville, Tennessee. There they participated in a worldwide scientific competition. The team had just a few weeks to earn the funds needed for entrance fee, lodging, food and airfare. But with the support of the community, schools and local businesses they did it. Jina Denney, adviser for the CMS Tag team said the group did great for their first time at such a large competition and it demonstrated the students' capability to do big things. Colton was one of the smallest, if not the smallest, public school district to participate at the global challenge. Other 2018 standouts mentioned in the survey were the Colton High School softball team making it to state and the Colton High School's summer league softball team winning the state tournament and going on to play at the Regional Senior League Softball Tournament in Missoula, Montana. Community events getting votes were the successful FujiFest hosted by the Colton Volunteer Firefighters, the always well-attended Coltontel annual Christmas tree lighting and the generosity of the Colton community to Helping Hands Food Bank and Colton Aid Network. Of course the Colton Volunteer Firefighters and their service to the community was mentioned over and over, so in next week's Colton Corner there will be a year-end summary letter from Chief Richard Beaudoin and some input from the volunteers. Colton Elementary and Middle School principal (last year's high school principal) Tori Hazelton was asked about standout moments in 2018 in the Colton School District. "It's always hard to pick a few really awesome moments," Hazelton said in an email. "But here are a few. The spring musical, 'The Sound of Music', was fantastic. The staff appreciation banquet that our superintendent and school board put on was standout; and the high school graduation is always a wonderful event and was definitely one of my highlights. Our new hires—all of them are doing a fantastic job for us—we are lucky to have them on our team!" Marlene Muhs, customer care supervisor/executive assistant for local internet and telephone provider Coltontel, said the best thing for the co-operative was adding the EZVideo product that delivers television services over fiber optics and can be viewed on any mobile device. The company is planning to use this fiber-based service for television viewing exclusively in the new year. In 2018, the local water district received a $135,000 grant from the United States Department of Housing and Urban Development to replace 1,200 feet of four-inch water line with six-inch C900 PVC and to add a fire hydrant at the north end of Virgil Road. It was completed during the summer.